Interested in following what's happening in the district through social media? You can click HERE to get to the district's social media directory, which contains links for all of the schools and the district. Also, you can access Dr. Moyer's blog HERE. More information regarding School Report Cards can be found here. Current lunch menu found here. We do not provide supervision, and will not be ringing entrance bells. At its January 23rd meeting, the Board of Education approved both the 2018-2019 and 2019-2020 school calendars. The first day of school for the 2018-2019 school year will be Wednesday, August 15th. Both calendars can be viewed and downloaded HERE. When CogAT Scores are released for current 2nd and 5th graders, parents can use their child’s CogAT score profiles to help differentiate instruction. Click HERE for information. If parents are looking to assist their child at home they can use their students MAP scores on Khan academy for recommended practice resources. Click HERE for information. Parents!!! Mr. Habecker has a YouTube video explaining each and every lesson (identified in the upper right-hand corner of each homework sheet). In addition to giving emergency aid for rent, utilities, etc. to Elmhurst families and people with students in District 205, EWAN also has two programs directly related to the schools. One is SWAN (Students with Activity Needs), where we can provide financial assistance with some activities that fall through the funding cracks, such as Band trips, dually enrolled college/hs course fees, etc. EWAN also works with the school social workers and provide snacks for students on free or reduced lunch monthly at all of the schools who wish to participate. If you missed the Summer Recreation Open House (SROH), please find a searchable database HERE. The database includes over 100 groups and organizations to keep your student(s) busy this summer! You can sort by program type, registration date, distance, length and more! CLOSED - THANK YOU! Please join us next year. 17TH ANNUAL SUMMER RECREATION OPEN HOUSE – Mark your calendars! You are invited to attend the 17th Annual Summer Recreation Open House sponsored by the Elmhurst District 205 PTA. This is a FREE event open to all Elmhurst families and neighboring communities. Browse the tables of various organizations offering summer activities and camps for all ages and abilities. This open house will be held on Wednesday, February 6, from 6-8 PM at York High School. On your way over, stop by the Pot Belly Eat & Earn that same night from 5 to 8 PM on St. Charles Road. No flier or coupons needed. PTA Council will receive a percentage of the total sales collected during those hours. Fundraising proceeds are used to provide scholarships to York seniors. Looking for a unique stocking stuffer that also supports education? The District 205 Foundation offers hand-forged, pewter ornaments of each K-8 school, York High School, Churchville Schoolhouse, and York note cards. Last day to order before break is Wednesday, Dec. 19. For details about these items and other gift options, visit http://www.elmhurst205.org/foundation_gifts. This year, students and staff are benefiting from over $192,000 in Foundation funding that provides educational enhancements, more resources and additional programming across all K-12 district schools. This is a direct result of community support, and we thank all of our donors for their generosity. We are currently seeking Foundation sponsors for this upcoming year. Contact our Executive Director at 630-617-2328 to learn more about this special opportunity. 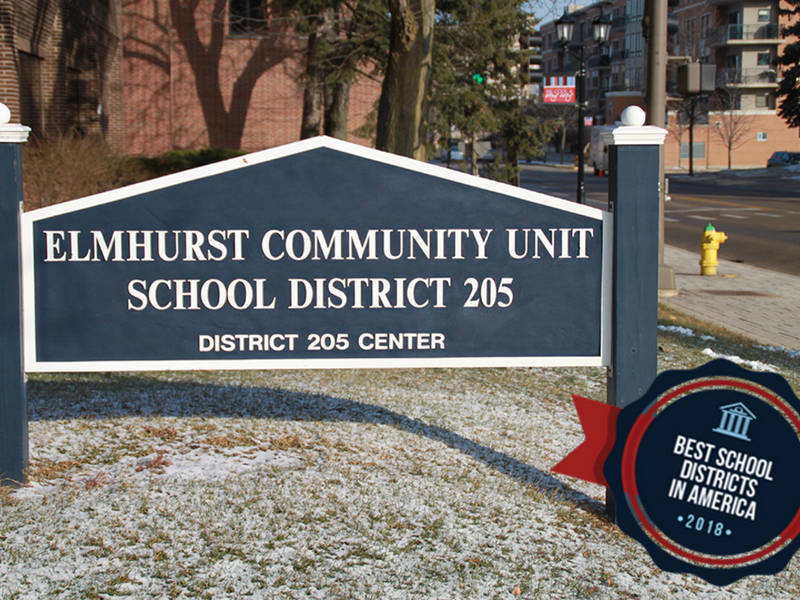 Learn more about us by visiting www.elmhurst205.org/foundation. CLOSED FUNDRAISERS - THANK YOU FOR YOUR SUPPORT! Support the charming Elmhurst tradition of tree lined streets by volunteering as a block captain or purchasing an outdoor or indoor tree. Neighborhood Tree Order deliveries Nov. 24th , pick up Dec. 1st. Visit www.elmhurst205.org/HolidayTrees for information and to place an order. Come cheer on your favorite teachers and principals as they play the Harlem Wizards on Saturday, November 3rd 5:00 pm at York High School. This is a laugh out loud family friendly event that is sure to entertain. General, Reserved and Courtside tickets available. Visit www.elmhurst205.org/wizards for details and tickets.